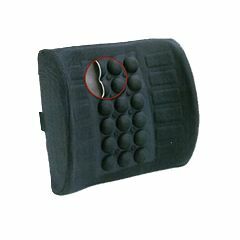 The IMAK Back Cushion is an unique design offers seating comfort and orthopedic lumbar support. Its ergonomic shape hugs your back improving posture and reducing stress on the lower back. Large and small vacuum-formed air pockets in the back cushion provide a 'pressure point massage' to your back. This stimulates blood circulation, invigorating back muscles to help ensure a healthy back. The unique air pocket design of the Imak Back Cushion allows air to circulate preventing your back from getting 'hot and sweaty'. Cushion provides Back Pain Relief. Improves the ergonomic comfort of your office chair or your favorite chair at home. Universally designed to fit nearly every car seat. Vacuum-formed air pockets provide pressure point massage. Elastic strap secures the back cushion to any chair. Sculpted, high-grade foam is covered with durable poly material. Cushion has back zipper allowing cover removal. The Imak Back Cushion is returnable within 30 days of purchase. Solid Construction. Effective. Easy To Use. 60 yr old bad back. Conditioning Exerciser. I bought this cushion to replace a cushion that was worn out that I use in auto when we travel. This one is 100% better. Used it to take a 500+mile trip the next day and it was BETTER than I expected. Rate it A+. I just found it by accident on the internet and sure glad I did. Made well, can even wash cover. Great! Solid Construction. Easy To Use. Stabilizes. Effective. 60 yr old bad back. back problems. Long Term User. need extra lumbar support. Use in our chairs for extra lumbar. Have in our car also. Helps keep back from aching from slouching.. helps keep back relaxed. Found the cover can be washed which is a plus. Seems very sturdy. Attractive Design. Effective. Easy To Use. My daughter liked the first one I bought for her so much that she wanted another one. So I ended up buying two...one for her office chair and one for her car. This back pillow is great! Frequent Exerciser. back problems. need extra lumbar support. I use this back support at work and it really helps support my back and doesn't make me sweaty. Occasional Exerciser. 60 yr old bad back. back problems. need extra lumbar support. my l-5 and down are not a line the curve out to the side would this help to keep it a line once the p.t. personal work on it to align it? Yes, it forces you to sit upright and in correct posture. I order it for work since I am 6'4 and sit at a desk all day and slouch. The cushion works well. Does this device require any power?